Our top-selling and highest-rated vegan protein powder! 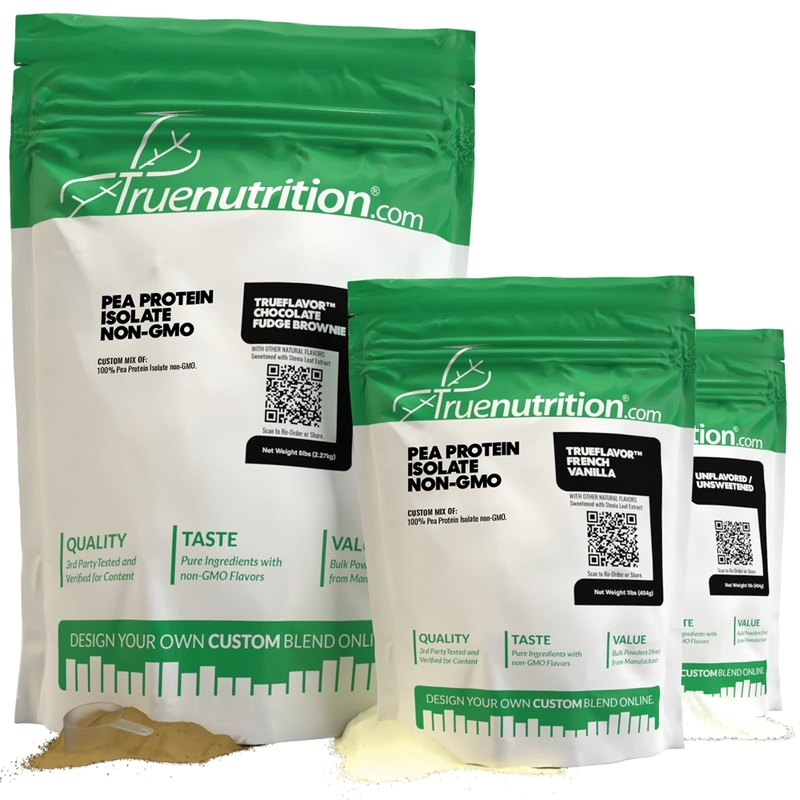 True Nutrition's Pea Protein Isolate is sourced from the highest-quality raw ingredients on the market, using only vegan and non-GMO yellow peas that are harvested at peak potency from our European supplier. Pea Protein Isolate is processed using cold-water microfiltration, and provides 25g of vegan protein to help support muscle-building! Uses: Supports Muscle Building: Provides 25g of protein to help support muscle building! Mix-ability: Shake or stir thoroughly for best results. Taste: Mild earthy taste that goes best with chocolate, vanilla, mocha, and caramel flavors! Mix 1 Serving (About 1 Scoop) in 8-12floz of water, juice, or milk. Stir or shake, and enjoy! I'm gonna be completely honest because I heard a lot of good things about this protein. Taste: I got the chocolate fudge brownie flavor and mixed it was unsweetened flaxmilk. I would definitely recommend doubling the flavor intensity. As someone below mentioned, it's like protein with a hint of chocolate. If using water or an unsweetened milk, definitely use stevia or sugar or fruit to sweeten it. 5.5/10 Mixability: mixes very easily, no clumps. 10/10 HOWEVER gets extremely thick with only 8oz. Use 12 oz liquid. I have not tried the other flavors but some of the other reviewers really enjoyed the carrot cake flavor. My rating is only for the chocolate fudge brownie flavor. Here's what i got in my product.... Boosts: Electrolyte, Protein Enzyme, BCAA, Essential amino, super greens, probiotic x2 Flavor carrot cake I mix it with a cup or two of almond milk and just chug it after a workout. I came straight from whey protein to this and i have to admit the recovery is the same if not better. So dont worry about losing out on aminos or anything if you compare whey and this side by side you would find that this actually is more complete in some regards. As far as flavor. mixing carrot cake x2 with almond milk and all the boosts makes it taste like pumpkin pie! which i enjoy a lot so thats nice haha. I would invite anyone reading this review to try the carrot cake flavor and mix with almond milk, its delicious. I got this flavored as carrot cake icing. Omg, it is just silky smooth. I love this!! I mixed it with approx 4 oz of water and it thickened up like real frosting. I thinned it down to drink with almond milk. It is seriously good. I don't even taste the peas. It has just the right amount of sweetness. LOVE IT!! Has ZERO grit to it. I decided to go with pea protein for purely ideological reasons (more earth friendly). I've never had issues with whey protein on my digestive system. I'm glad that this pea protein is pretty much the same. This stuff does get THICK quick when mixed with almond milk... I'm sure there's still some testing to see how much is ideal for just drinking straight. I went with chocolate since it's been a safe bet in most other protein's I've had before... Maybe my taste buds are fried but I might double the flavor dose next time, it's more like "protein with a hint of chocolate". Regardless, I think the quality for price is still justifiable, and being able to order exactly as much as you want (and tweak the blend if desired) is cool approach to this rather crowded marketplace. I've tried many different vegan protein mixes over the years. In the last year I was bummed to find that so many have been tested with heavy metals in them. My friend brought me here when my search for a new, good tasting began protein was becoming hard. I love that they use few ingredients and the customization is the BEST! I've tried the chocolate brownie, which is good. Sometimes I like to do 1/2 chocolate with 1/2 thin mint cookie (it literally smells like you blended up thin mints). My favorite so far as been the cinnamon bun. All the flavor options are GREAT because many vegan proteins come in very few flavors. I like to get a big bag of a base flavor and a few small bags of other ones to change it up each day. They all blend well, I usually do them in shakes but haven't tried them as a drink yet. They're easy on my stomach which is a huge plus. So glad I found this protein and LOVE that it's affordable! I do a 60/40 blend with rice protein so I can't review this purely on its own. I do, however, get it unflavored and unsweetened. This blend has been my go-to for at least 1.5 years now and my most recent shipment arrived a few days ago. The texture and color has changed quite a bit! It's so easy to dissolve and has ZERO grittiness. This stuff is like the Vega protein powder I used to get in terms of texture but Vega is strongly flavored, sweetened, and uses other proteins. Goes down so smoothly and taste is very inoffensive. I really like this product. I've tried a bunch of other pea-protein brands because whey really upsets my stomach, and this is definitely my favorite! It tastes less chemically than other brands and it's nice that you can basically create your own. I would recommend getting samples and trying a few flavors before ordering it in bulk as I was surprised by which flavors I liked vs. didn't like. I tried: - Toasted coconut: was OK, would definitely not order in bulk -Chocolate coconut bar: this one had a bit of a weird after taste. Would not order in bulk. -Cafe Mocha- this one's really good if you love the taste of coffee. I was hoping it would be more muted, but it essentially tasted like a mocha from starbucks. If you like that, def. order this one! -Chocolate fudge brownie: pretty good! Would order in Bulk But MY FAVORITE was surprisingly the Cinnamon bun. It's super tasty - I ended up ordering a 5lb tub of it! Been ordering this for quite a while. I add TrueVanilla flavor when ordering and mix with unsweetened almond milk. I like it except it gets way too thick if I don't drink it immediately. I like that it gets thick when I'm making protein banana shakes, but I prefer a thinner consistency when if I'm sipping on it while doing something else. I LOVE this stuff! I first tried a few samples and I was hooked. This protein is so smooth and tasty! Most other plant based proteins are gritty. I was pleasantly surprised! I've tried a few different flavors so far, and I love them all! Best of all it's a good price. Previously had bought 10 lbs of Vegan Optimizer forumula. I did not like that because it clumped up/did not dissolve, and did not taste very good. Just got this in the TrueFlavor Chocolate Fudge Brownie flavor and it dissolves all the way, and tastes great, with a slight nutty flavor as others have said! It is very thick and satiating! It is also the cheapest non-soy protein source! 2 thumbs up!